Whether it's a two-day business trip or a months-long voyage, it pays to prep your fridge before you leave. As much as Samsung and LG continue to promote the wonders of the Smart Fridge, the fact remains that no refrigerator can preserve food forever, even if it comes with Twitter or Pandora. Until your fridge has the ability to sense expired goods and dispose of them on its own, you, the consumer, will have to be the smart one. So what do you do when you’re planning on leaving home for a weekend, or a month, or even longer? Most people don’t think about it, but it’s important to prepare your fridge for your absence. Left untended, it’s almost like it gets lonely and petulant without you. So satiate your fridge’s ego by giving it some attention before your departure. 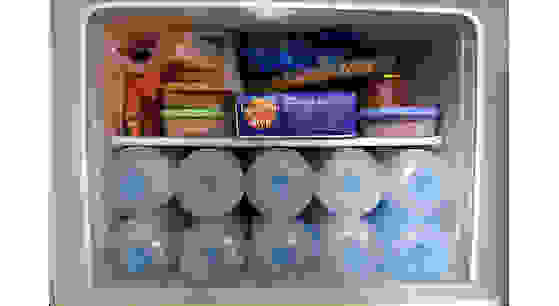 Depending on the length of your trip, here are some tips for getting your fridge ready for some time away from home. Check expiration dates — Though they won't turn your fridge into a biohazard, expired milk, cheese, eggs, cream and meat, can produce some nasty smells. Purge any perishables on the verge of grossness. Raise the temperature — With at-risk perishables gone, you can kick the temperature up a degree or two to save some energy (and a few cents on your power bill). Just remember to always keep it south of 40°F. If you’re planning on being away for about a week to 10 days—a pretty typical length of a vacation to the Caribbean or the opposite coast, for instance—you'll need to take a few additional steps to preserve as much food as you can, and prevent unpleasant smells in your fridge. Buy fewer groceries — It's better to run out of food before a trip than to waste uneaten meat and produce. You can always order take-out to fill the gap. Remove most perishables — Unless you just bought your milk and veggies, they'll probably be spoiled or less-than-appetizing by the time you return. Eggs should be fine. Freeze your meat — It's like hitting the pause button on the expiration date. Thaw and eat when you get home. Get rid of leftovers — If you haven't eaten it by now, you definitely won't eat it when it's back. Condiments will be fine, though. Raise the temperature — Again, if the perishable foods are gone, you can bump the temperature in the fridge up to about 38°F to save energy without risking the safety and longevity of the remaining goods. The same thing applies to the freezer. Turn off the ice maker — Mainly to save energy. 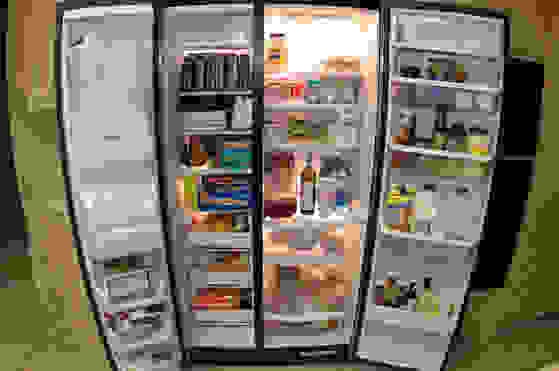 Unless you plan to leave some perishables in the fridge, you should raise the temperature of the fridge to about 38 degrees Fahrenheit; this ensures coolness (and longevity) for perishable goods while also saving you on energy costs. If you’re backpacking across Europe or going on a month-long, cross-country road trip, you really need to get serious about refrigerator preparation. Remove all perishables, leftovers, and open containers — If it can go bad, assume it will go bad while you're gone. Get rid of it now to save yourself some trouble later. Freeze meat if you feel like it. Condiments will be fine. Raise the temperature — Just like with shorter trips, you can safely raise the temperature in your fridge because the at-risk goods are gone. Aim for 38°F. Add a box of baking soda — This will help neutralize bad odors and limit the accumulation of mildew. If you’re planning on being gone more than a month, do yourself a favor: Throw everything out. There’s no need to attempt to preserve that frozen pizza or carton of OJ. Just let it go, for the sake of kitchen sanitation and energy savings. But you'll still need to do a few things. Turn off the water intake — If you have a water shutoff valve, use it. Turn off the ice maker — If the ice maker stays on while your water is turned off, it could burn out. If the ice maker stays on while the water also stays on, you're increasing the risk of an accidental overflow. Stuff your freezer with ice — Sealed bags or half-filled water bottles will work. A full freezer stays cold longer, just like a large ice cube lasts longer than a small one. If you're concerned about power outages, this step will keep your food cold for many extra hours. Clean it! — Use cleaning solution and damp rags to remove stains and food residue from every square inch of the machine. This means wiping down the racks and humidity drawers, and even getting dirt out from beneath the door gaskets. Also if you're leaving on a jet plane and don't know when you'll be back again, it’s also a good idea to stock up your dry pantry with non-perishable foods; after all, you’ll be returning to a home without a refrigerator. What else are you going to eat?